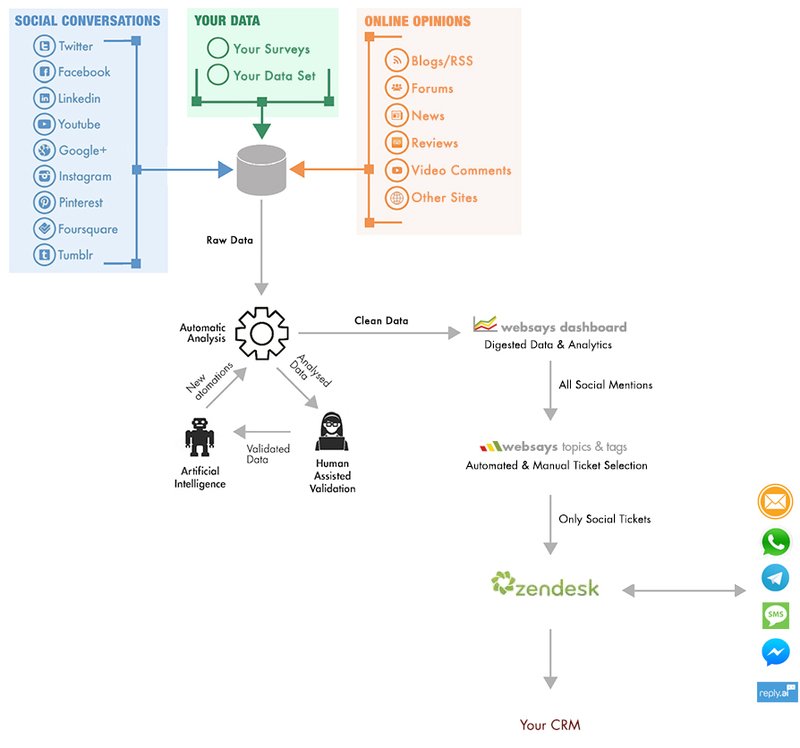 What does the integration with Zendesk make possible? At Websays we are very pleased to be able to offer you something new: the ability to respond to mentions rather than only listen to them, meet the new Social Contact Center. The main news is the integration of all channels. Websays gathers those mentions on social media, and Zendesk those on telephone calls, e-mails and even instant messages (Whatsapp, Telegram and Facebook Messenger). Welcome to the multi-channel Contact Center! 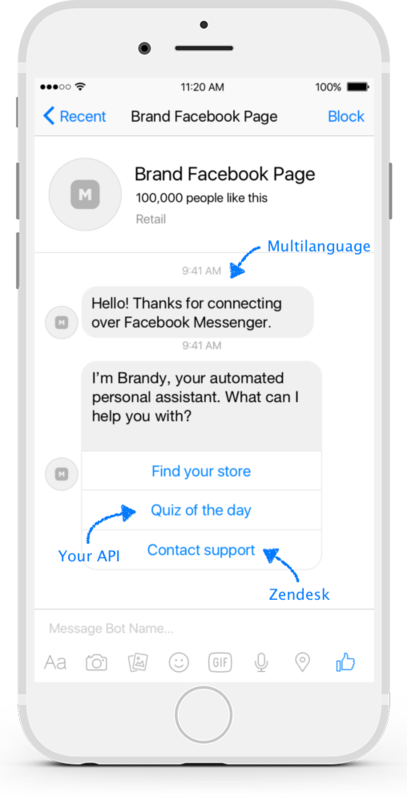 Websays can add the conversation beyond brand channels to its customer service inflow. For some of our clients, we have detected that some 40% of messages requiring customer service do not properly use the brand-established channels – whether because of ignorance or the supposition that adding @ or # is enough to arrive at that brand. We believe it is the brand that should make the effort to find the users and not the users who should look for the proper channels. Thanks to active multi-channel listening, any mention in which the brand is present will enter the system and – thanks to Zendesk – will be automatically assigned to a team or a person for a response. Imagine that the IT department directly receives a ticket when a user refers to a technical difficulty. This is a very fast paced world, and procedures must be streamlined as much as possible! Websays can be configured to generate tickets in Zendesk for customer service messages only, leaving marketing messages with Websays or manually assigning them to be managed by another contact center team. 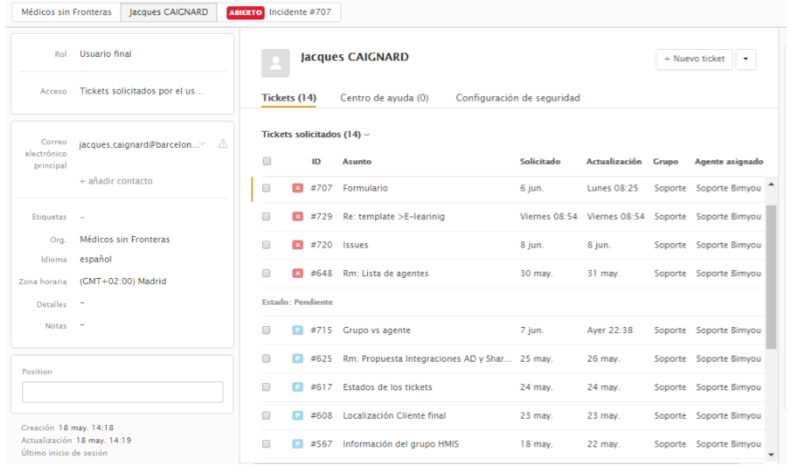 In the configuration phase, the client will decide what type of issues will be automatically passed from active listening to the ticketing system (Zendesk). The client can choose to limit ticket creation to mentions on certain channels only, or to those that contain certain terms or feelings, etc. 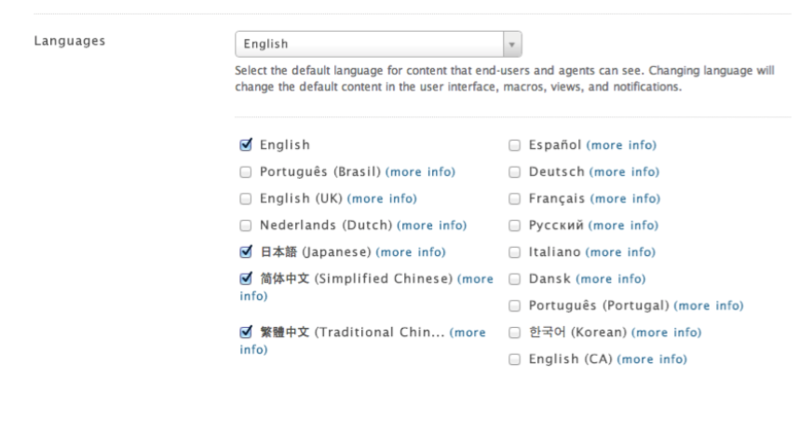 They can also be sent manually by one click from the Websays Dashboard. Integration with CRM systems like Siebel and with virtual assistant systems like Reply.ai, in which the agent can take control at will. Intelligent language detection: The ability to know the clients’ preferred language even before beginning an interaction. The ability to create workflows that automatically distribute tickets to those agents who speak those languages, thereby reducing the time needed to respond and resolve the tickets and assuring customer satisfaction. 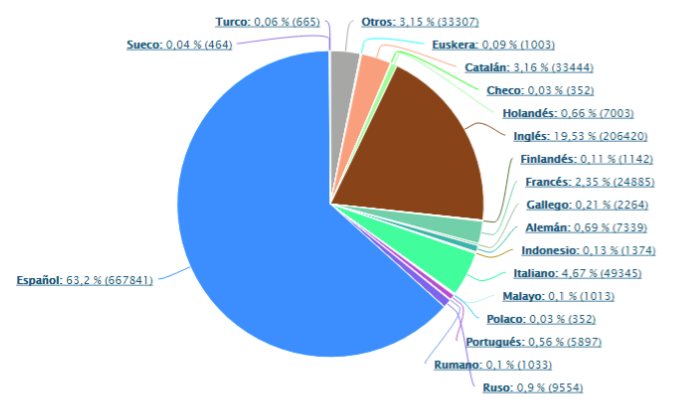 The ability to count on a multi-lingual support team: the platform can be configured so that each agent can interface in his or her preferred language. 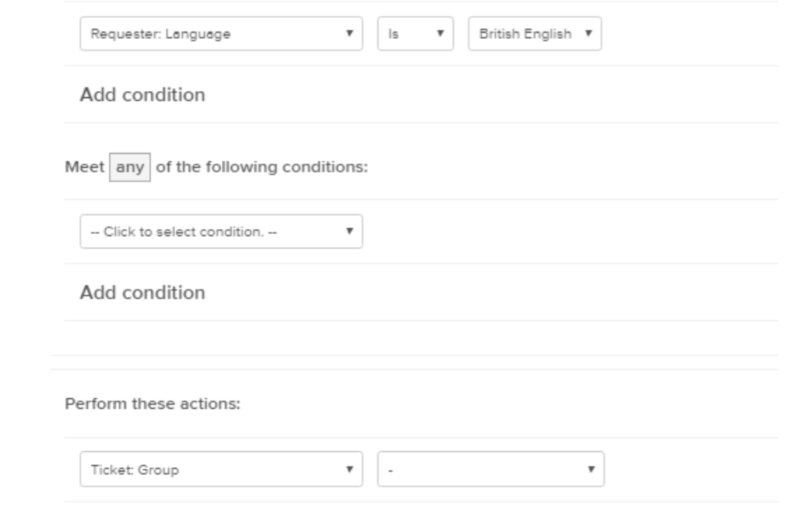 Ease of management of communication in several languages with Zendesk’s dynamic content function. The dynamic function allows automatic replies to be created that can be sent to the users according to their language preference. The solution is in the cloud and accessible in a centralized way from the Zendesk dashboard, including access to the Websays Dashboard from Zendesk’s. A smartphone version is also included for management analysis or information. 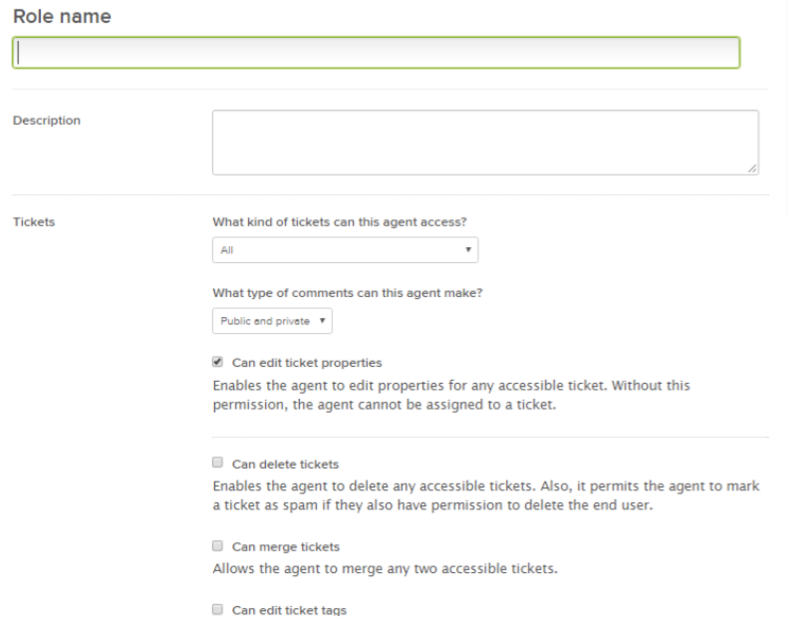 Zendesk’s solution can define an agent’s role and assign said roles to any agent on the account. This permits the definition of agent’s roles according to what is most convenient for the structure and workflow of the business in question. A client’s record: All public and private interactions with a client can be seen in a single conversation thread, displayed by criteria like the order in which they occurred, from most to least recent. Automatic or manual grouping of several profiles for a single user. Automatic thematic classification. The responses are classified or sub-classified automatically (billing compliant, baggage question). Alerts for mentions @profiles, #tags (fire, emergency, etc.) Notifications via Whatsapp, mail, SMS, etc. Yes, there’s still more to tell! If you want to know how we can help you, don’t hesitate to contact sales@websays.com and ask for your free, personalized demonstration.